Node Conf London was just last week but videos are already up. Enjoy talks on ES6 on ChakraCore, the state of Node core, and more. Built by the RethinkDB team, Horizon brings together RethinkDB and a toolkit for rapidly prototyping and deploying apps into a framework. A variety of bug fixes and upgrades to npm, V8, and libuv. A simple and good-looking Twitter client built with Electron, the toolkit for building cross platform desktop apps with Node, HTML and CSS. At JSConf Uruguay, Rod Vagg gave an illuminating talk about how the Node project works, particularly its open governance model. See how your app spends its time, like database, cache, external http requests, and who wrote the slow code. The goal is to make an eventual upgrade to Node 6 a lot easier. A simple walkthrough oriented around Botkit. 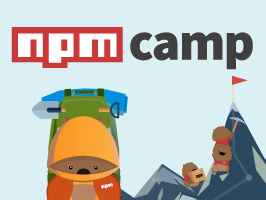 Optimizes the workflow around managing multi-package repositories with git and npm. node.cobol makes it possible to execute Node code from within a COBOL program. Datadog enables you to visualize and alert on latency metrics, throughput, errors, and more. An advanced access layer to node-postgres via Promises/A+. Makes it easy to create basic APIs without custom code. It’s a middleware so you can mix it with other apps, such as existing Express-based apps.